A valid prescription is required to buy Cetrotide online. The active ingredient in Cetrotide is called Cetrorelix. Cetrotide prevents eggs from being released too early, this process is called controlled ovarian stimulation. Cetrotide blocks the gonadotropin-releasing hormone (GnRH) that causes eggs to be released from the ovaries giving the eggs more time to develop before they are finally released. Cetrotide is a very effective fertility drug and is often used as part of an IVF drugs program. This package contains 0.25mg Cetrotide powder and solvent for solution for injection. The injections are not pre-prepared. In the US Cetrotide can be bought per injection. 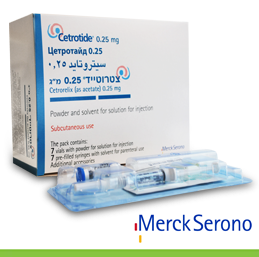 Cetrotide is supplied in boxes of 7 injections. Cetrotide is a controlled ovarian stimulator, used in women experiencing fertility difficulties. It works against the GnRH hormone and allows the egg more time to develop before being released. Cetrotide is used alongside HCG hormones which encourages the egg growth and the healthy ovulation of mature eggs. Common Cetrotide side effects include: Redness/pain/itching at the site of the injection. Serious Cetrotide side effects that require urgent medical attention include: pain, swelling or severe cramping in the abdomen area. If you develop a rash, itching/swelling (especially of the face/tongue/throat), experience severe dizziness or have trouble breathing it might be caused by a severe allergic reaction, seek urgent medical attention. Excelente servicio de atención al cliente y rapidez en el envío. As initally skeptic about getting medication over seas but they were very professional, fast delivery, and the medications were quality. Great experience with this company. I highly recommend and would issue again. Can recommend highly. Good prices and shipping was fast. Fully trackable. I was delighted to open the box and see everything needed for a dose neatly packaged in individual units. Only thing that could be better is if it included a Q-cap for mixing, rather than the needle which is difficult to maneuver.